I get the pleasure of meeting people like Ofo Ezeugwu, thanks to my friend Jon Schultz, who was able to connect me with this future leader, visionary, and entrepreneur– who is destined for great things! If you don’t know Ofo, you need to. His personal story and vision is really, really inspiring. And his startup is doing meaningful things. He has a way about him that is both inspiring and incredibly humble at the same time. Very rare, indeed. Check out his site and if you’re so inclined and support his mission (https://republic.co/whoseyourlandlord). He is exactly the type of person we need to be mentoring, supporting, and investing in, as he is going to no doubt change the world– one satisfied apartment renter at a time. Michael Beckerman: What’s your background? Ofo Ezeugwu: I was born in Paterson, NJ. My parents are from Nigeria and Barbados. I grew up primarily in Ellicott City, MD and was always taught from day one that the most important thing you can do on this earth is to help others. So, I do that each and every day. I graduated from Temple University in 2013 and have no founded two companies and I’m also a professional actor and model. MB: What led you to start WYL? OE: During my senior year at Temple University, I was the VP of the student body. In that position, I dealt with many things happening off campus that were affecting students on campus. Housing was a top issue with students due to the rapid gentrification adversely hurting folks from the community and the students who were often left to live in subpar conditions (black mold painted over, poor plumbing, harassment, etc.). I felt there had to be a way to review landlords, that way you’d know what to expect before signing a lease. MB: What does the site do? And how big is the site today? Corporate partnerships with American Express, Allstate, Roadway Moving, Dominion, etc. Recent coverage: Featured in Forbes, NY Post, NowThis, Philly Inquirer, Blavity, Curbed, Newsweek, TechCrunch, etc. MB: How have you funded the site and what are your future funding strategies? OE: We’ve funded the site through bootstrapping and then by raising a pre-seed through several angels and investment groups. We’re now raising capital on Republic.co/whoseyourlandlord, so I’d encourage folks reading this to invest today! Time is running out on the campaign. MB: What are your expansion plans, short and long term? OE: When it comes to expansion, as our recent Forbes feature stated, we’re going global with this. There are rental issues happening all over and we receive daily emails and social media messages requesting our services in other cities, countries, etc. In the short term, we need to continue encouraging the free flow of transparent, thorough home provider reviews while also scaling our voice of advocacy for fair, equitable, and quality housing for all. By developing our voice through our content, we’re stronger as a collective community. The next step is expanding to new cities and partnering with several institutions of higher ed, landlords, and local municipalities. MB: What do you enjoy about being an entrepreneur and what is your personal motivate and drive based on? OE: I enjoy being an entrepreneur because I’m a creator, a doer, and Liver! Each day I get to create the future I see ahead of me. I’ve surrounded myself with an AMAZING Team that is all about doing the work. To see them win, our community members win, and my family win means everything to me. MB: You have a pretty amazing personal network of contacts in business, politics, culture etc…who are some of the people that inspire you and why? OE: People I admire: My parents and family, Felix Addison (WYL), Dave Patrick (Columbia University), Chris Coleman (N. 13th), Jon Jackson (Blavity), Rhonda Elnaggar (Mic), Pat Robinson (Emmis Group), Liris Crosse (Project Runway), Nick Bayer (Saxbys) and many more! These folks are in my personal network. And then I admire Will Smith, J. Cole, Kendrick Lamar, Yara Shahidi, Ryan Coogler, and more. Both these lists are actually so much longer; nevertheless, my reason for the Love: These folks are builders, creators, Lovers of Life, and will stop at nothing to achieve their success, their community’s success, their happiness. MB: What’s next for Ofu? Ofo Ezeugwu is co-founder and CEO of WhoseYourLandlord, a platform empowering and informing the rental community through landlord reviews, community focused content, and by providing access to quality listings. He graduated from Temple University, where he was the VP of the student body and also the youngest alumni convocation speaker in the school’s history. 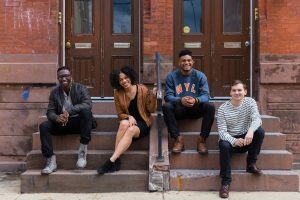 He’s a Techstars’​ Risingstar, one of BET’s #30Under30, a Black Enterprise: Modern Man, and his work has been featured in Forbes, TechCrunch, Newsweek, The Philadelphia Inquirer, Blavity, The New York Post, and more. As many of you are already aware of, Ofo is also a professional actor and model who’s walked in NYFW (3x), been featured on the Today Show (7x), and worked with Nike, ESPN (2x), and Alfani.